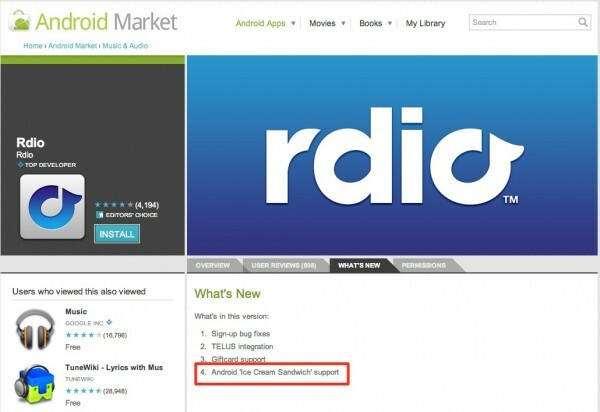 According to the makers of popular music subscription services Rdio, their app is now compatible with the newest version of Android aka Ice Cream Sandwich. Wait, what? Yeah, the same OS that head Android honcho Andy Rubin, told us wouldn’t be available on handsets until Q4 of this year. Any chance they have a build early? It certainly seems highly unlikely that anyone would have it at this time, but I guess you just never know. It’s our understanding that they have, as of this week, chosen TI to be the processor (more on that in a bit) that’s used to help develop ICS, so seeing an app company with access to it already just seems odd. Do they know something that we don’t? Any chance we see builds of it before Q4? Ehh, not betting on that. Or did they simply mean “Honeycomb” instead of ICS? Probably.